What is a "critical issue"? - Fire prevention, post forest fire effects on landscapes and wildlife. - Water safety issues (boating, swimming, etc.). - Resource management/protection of endangered species or habitats. - Closure of areas due to migratory bird nesting. - Resource management of fragile resource sites (sand dunes, bogs, etc.). 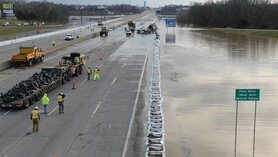 - Site damage due to severe weather (tornados, hurricanes, etc.). - Resource protection issues for cultural or heritage sites. - Visitor safety issues related to wildlife encounters. - Visitor safety for extended back country or wilderness hiking. 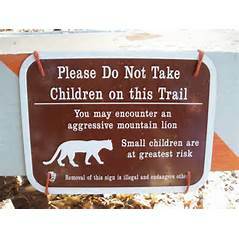 - Mountain Lion sightings within a park or forest. - Interacting with bears or other park/forest dangerous wildlife. timber harvests, prescribed burns, etc.). - Other site management, management events, safety issues or other issues at your site that you need to inform your visitors about. Unit One - What is a Critical Issue? Unit Two - Analysis of the Critical Issue - Critical for Who? Unit Three - Why is this issue critical for the organization or agency. public relations, visitor action or non-action, etc.). Unit Six - Developing a Change/Public Relations Strategy - the Steps. Unit Seven - What do you want to happen - and by when? Your objectives. Unit Eight - How will you need to relate to different target market groups? Unit Nine - Create a time line/priority check list of the order in which you want to implement your critical issue interpretive campaign. Unit Ten - Identify the interpretive media you will need to put in place to address your critical issue messaging. Unit Eleven - Create your implementation budget. Unit Twelve - The political process - what will you/your team need to do to put the critical issue/change strategy into action - short term and long term. Make a list. Unit Thirteen - the lucky number - evaluation strategy short and long term. Evaluation to see if your critical issues interpretive and PR objectives being met? Course Product - helping you develop your critical issue interpretive strategy document. The cost for the 32 hours training with live interaction with the instructor is $400.00 USD. You can pay via credit card or Pay Pal using the Pay Now button below. 2. If there are openings you'll be sent a simple registration form to fill out and return to John. 3. Once you receive your registration form/placement confirmation, then you can return to this web site page to pay the course tuition. You can pay by credit card or paypal by using the Pay Now button below. 4. Once all this business bit is completed, John will send you Unit One and all related course materials and an e-copy of his text book "Interpretive Master Planning". He will also be happy to chat with you as well to make introductions, learn more about any critical issues you'll be focusing on, and get you started.